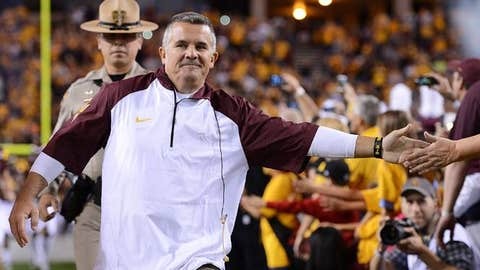 ASU announced Wednesday that offensive coordinator Mike Norvell has been promoted to deputy head coach. 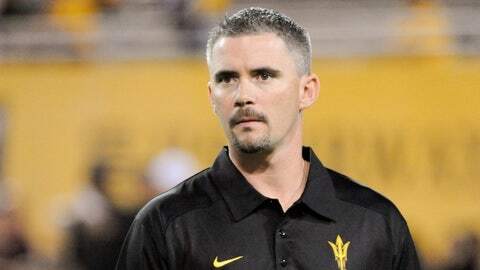 TEMPE, Ariz. — Arizona State announced Wednesday that offensive coordinator Mike Norvell has been promoted to deputy head coach. Norvell, 32, reportedly interviewed for the head coaching vacancy at Arkansas State recently and last offseason was pursued by Auburn for a high-level assistant coaching position. ASU issued a news release saying the promotion "solidified" Norvell’s intent to remain at ASU. The release also noted president Michael Crow’s involvement in the promotion. "I am committed to the long-term success of this program under the leadership of Todd Graham," Crow said in the release. "Rewarding the skills of a master teacher like Mike Norvell is a demonstration of that commitment. Coach Norvell’s performance as offensive coordinator has been nationally recognized, and this promotion reflects the remarkable track record he has established in the last two years at ASU." Amid Auburn’s pursuit last season, Norvell received a substantial raise to more than $500,000, making him the fifth highest paid assistant coach in the Pac-12. Graham confirmed Wednesday the new position comes with another raise. "We’re paying him what he’s worth, and that’s like a top coordinator in the country," Graham said. The new deal also gives Norvell more responsibility within the program. "I believe we’ve got a tremendous future in front of us, and to know that I’m going to be here and be a part of it, I’m extremely excite," Norvell said. "I think it shows a tremendous amount of commitment to where our program is going. This year we got to the doorstep, and we know there are greater things ahead." Norvell, who first joined Graham’s staff at Tulsa in 2008, has made ASU’s offense one of the most potent in the Pac-12. Last season, ASU ranked second in the conference in scoring (38.4 points per game) and fourth in total offense (464.5 yards per game). It holds the same rankings this season with 41.0 points per game — ninth most in the nation — and 460.8 yards per game. ASU eclipsed 50 points in a game six times this season for the first time in school history. "He’s very deserving of (this promotion)," Graham said. "This is a part of him advancing himself and he deserved it. He’s the best football coach I have on this staff, he’s the best recruiter I have on this staff (and) he’s the guy I lean on more than anybody else." Norvell has been lauded for the development of quarterback Taylor Kelly, who was third on ASU’s depth chart when Graham and his staff arrived. He’s also been praised by Graham as his best recruiter. The promotion and new contract likely ensures Norvell will remain in Tempe for at least one more season. It also seems to suggest Norvell would only leave for a BCS level job. That the university president had a hand in working to retain Norvell displays how much he is valued at ASU, which, according to sources around the program, has gone to unprecedented lengths to keep Norvell on staff. "Never before have we even come close to this commitment to keeping a quality staff and doing the things you need to do — that’s providing security, providing opportunities and also paying (assistant coaches) and being competitive in that," Graham said. "Never before has this university made the kind of commitment they’re making." Norvell said talks with other schools this offseason got "pretty serious," and he had to weigh his future aspirations of being a head coach against the quality of the situation he has now. Norvell cited his fellow coaches and players as well as ASU’s administrative commitment to football as things that swayed him in his decision to stay put. "One day I do want to be a head coach, and that’s something I’m going to work toward and continue to prepare myself for," Norvell said. "But I think it’s speaks volumes to the situation we have here — where we’re going, where this program’s going — and I’m definitely excited to be part of that." Follow Tyler Lockman on Twitter.